Oh my god. Thank you for this AMAZING recipe!!! We don’t have Thanksgiving here in Australia but I’m half American and decided to throw a thanksgiving party for 10 of my friends this year. I somehow thought it was sensible to lure them in with the promise of a turkey without having ever roasted/smoked/brined/seen a turkey. Because I don’t have a smoker I opted for just regular roasting and after some research, decided to roast it in an oven bag (something else I’ve never done). Besides being thrilled beyond words that I actually pulled it off and didn’t require medical assistance and/or a fire brigade, this recipe was SERIOUSLY AMAZING. My friend even said it rivaled his mum’s infamous Christmas turkey. Highest. Praise. Ever. Roasting it in the bag meant that it stayed moist so I didn’t need to brine it (even though that sounds life-changing and may try it next time) or do anything during cooking time and it took only 2 hrs to cook a 4.2kg/9.2lb turkey! It actually caught me by surprise because I wasn’t expecting it to be done yet, but thankfully even though it had to sit for a while until everyone arrived, it was still lovely and moist but with crispy skin and tasted fantastic!! Thanks again!!!! We actually made this today [ 8-9-2014 ] It was DELICIOUS! We all agreed that we had never had such a tender turkey. The meat was absolutely succulent! We smoked a 5# breast [ with bone ] in about 2.5 hours. Couple bits of advice: 1 — have an entire bottle of bourbon before you begin. You will use almost an entire bottle. 3 – you will need a extra large ziploc bag for the brining; a 2 gallon will hold almost all the brine and the turkey breast. 3 — there is A LOT of salt for the entire recipe. I did not use low-sodium broth and I wish that I had: our grave was very salty. 4 — Save the carcass – it makes an AWESOME starter to a pot of soup! 5 — Keep in mind that this recipe takes at least a day, you don’t want to hurry the process. I started the brine process about 4 PM and we began smoking the breast at 3: 30 the next day. We WILL make this again. We may substitue a dozen boneless chicken breasts next time. This is a wonderful meal!!! thank you!! Pingback: My Thanksgiving Menu  : Best of Baking with Pinterest! Alright, Jessica, we’re going to follow this recipe for Thanksgiving!! I never ate the turkey at thanksgiving until Nate smoked one last year. It was SO delicious and you never steer me wrong, so I’ll let you know how amazing it is on Instagram! :) Hope you’re feeling well. You are so close!! one opinion, which of course, is a matter of taste, literally: the brine was too sweet for my tastes. next time (and there will DEFINITELY be a next time! ), i think i’d eliminate the brown sugar from the brine and use 1/2 cup of the maple syrup. truly, this recipe will be on my grateful list for thursday! This was a HUGE home run! We’re making it for Christmas too! Pingback: | Happy Thanksgiving – Enjoy these Everything Turkey Links! This looks so delish! I would love to make this for Thanksgiving but do not have a smoker. Would this turn out as good if I roasted the turkey breast? I’ve made this recipe twice now, once with two turkey breasts and last night with a 20lbs behemoth. Both times it turned out great and my guests loved it. One comment that I received was that the gravy was a little chunky or grainy. Does anyone else have this problem or am I missing something. Both times I diced up the shallots and apple and when the gravy was complete sent it throught the ninja for a few minutes. Any suggestions? Recipe looks wonderful, no smoker though. How would you change the recipe to make it in the oven? Pingback: (pt.) How To Create A Rustic & Eclectic Thanksgiving | myvesk. This looked and smelled wonderful but sadly my turkey was still raw after 6 hours (followed the directions and those of my smoker) and the gravy was really bitter. My husband feels like he ruined Thanksgiving because of this. :( Well, there are plenty of sides to eat and I had a packet of Turkey Gravy in the pantry. Made this for thanksgiving. It was nothing short of spectacular and everyone was blown away. Two of my guests Contacted me Today to see if they could have some of the leftovers–it’s that good. We did ours in our electric smoker and brined using apple cider instead of the bourbon listed on the recipe. We used the bourbon in the water tray in the smoker and in the gravy—very tasty. Thank you from sparing me from a boring roasted turkey breast! This was the first time I have ever brined a turkey before smoking it. I used a 14 pound turkey & used your recipes for the brine, the rub and the gravy. (I doubled the rub) It took about 4 hours to cook & was super moist & tender. Everything was awesome. My husband & I declared this was our best bird & gravy ever. We are also thoroughly enjoying grazing on the leftovers. I am wondering, how much is 4 cups of bourbon? I checked that am.cup is same as 2,37 dl (and 8 fl.oz) SO 4CUPS IS almoust 1 litre? Theres no way I can steel one big bottle from my husbunds booze stocking:) Is 4 cups like 4 tiny cups? That turkey looks amazing ! Def gonna be making this sometime soon ! What did u have as side dishes with it ? 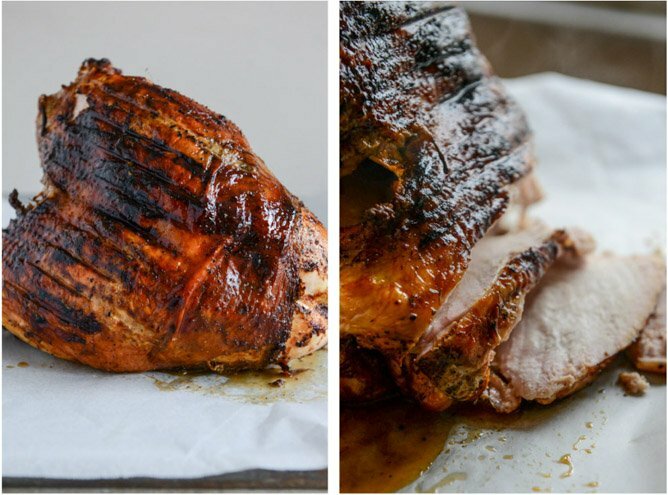 THis looks soo good, I’ve smoked our Thanksgiving turkey every year for the last 9 years. Last year I tried a brine I found online http://smokingmeatgeeks.com/how-to-brine-meat/, this year I’m gonna try this applewood turkey. Looks super yummy ! Would love to make it ! How do you make without a smoker ?? I made this yesterday for Friendsgiving and it turned out AMAZING! I just doubled the brine and the rub for a whole turkey (15 pounds) and it worked fantastic. I smoked it in our Weber Smoker at 200 ish for 4 hours with applewood soaked in apple cider. I had planned to finish it in the oven, but it ended up being right at temperature (around 150) when I pulled it out of the smoker. I let it rest and come up to final temp in the oven. Oh and the gravy recipe was amazing too! How was the skin? Was it like a rotisserie or was it crispy at all? A terrible waste of bourbon! I’m using my propane grill–low heat–to smoke the breast as I write. I’m 2 hours in and I’m wondering whether the skin will get crispy enough. 1) did you turn the bird during cooking? 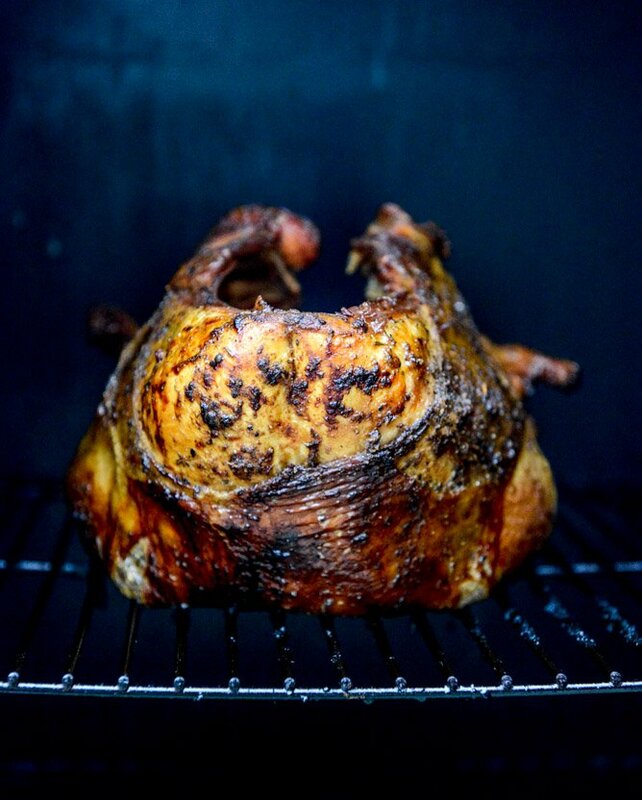 2) did you broil it to get crispy skin? hi sara! i did not try this on a grill, we make it every year but we use an actual smoker and it does get crispy. let me know how it turns out! Thanks Jessica for this wonderful recipe. I was nervous about using the grill to smoke it but it turned out fabulous. The skin was like a crispy rotisserie after 5 hours. Flavor was superb. My only problem was that I opened the grill too much and that resulted in less of a smoky flavor. I will definitely trust my equipment next time (no peaking)! I also took the temperature to 155 which resulted in a slightly dry turkey BUT only slightly. I’ll just be sure to bring to 150 next time. For those who want to grill, soak wood chips 15 minutes then wrap with foil. Leave ends of foil open so smoke can escape. Place directly over heat coil next to drip pan.